Definition at line 7 of file CREReportDisplay.h. 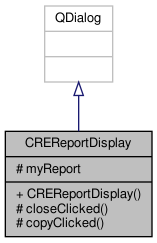 Definition at line 4 of file CREReportDisplay.cpp. References closeClicked(), copyClicked(), and myReport. Definition at line 36 of file CREReportDisplay.cpp. Definition at line 31 of file CREReportDisplay.cpp. Definition at line 19 of file CREReportDisplay.h. Referenced by copyClicked(), and CREReportDisplay().